We at 3bigtree.com are a bunch of wood enthusiast, who loves fine quality collectable exotic wood. 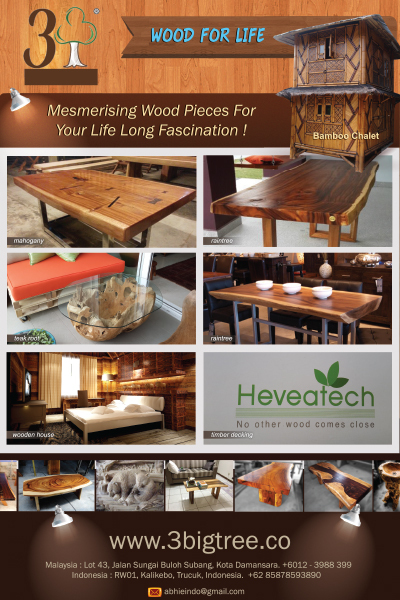 We make great one piece wood top, from Raintree, Mahogany, Teak, Palisander, Merbau and sometime other species. These wood tops can be turned into dining table, bar counter, console, coffee counter and kitchen top. Owning this wood is for lifelong fascination. We build and install wooden and bamboo houses or resort homes, gazebo especially for projects. We are also Timber Flooring Experts, with our own well experienced installation team. We provide FREE CONSULTANCY for any timber flooring matters be it INDOOR or OUTDOOR. Maintenance and Repair of timber decking is our Speciality. MORI engineered wood and HEVEATECH timber decking are also in our main product lists. A Place for True Wood Lovers..!